League as they were opening their first location at the newly renovated Staten Island Mall. That sponsorship became effective on September 2018. The combination of a highly competitive basketball group in tandem with a sports and game oriented highly competitive atmosphere as Dave & Busters provides a hand in glove fit. Dave & Busters is an American restaurant and entertainment business with headquarters in Dallas, Texas. Each Dave & Busters location offers a full service restaurant and a video arcade and as of July 2018 there are 117 locations in the United States and Canada. The newest location here on Staten Island opened its doors on July 1, 2018 and has been jam packed since day 1. Dave & Busters is a publicly traded multimillion dollar corporation which was founded in 1982. The Staten Island Basketball League as of this September begins our 39th straight year of existence at the same Public School Number 8. PS 8 is one of the oldest schools in New York City as it enters its 80 th year in September 2018. Since the beginning of the SIBL over 400 players from all walks of life, nationalities, religions, ages and backgrounds have walked through the gym doors. All brought together for the love of playing competitive basketball. Recently a call came into the league office from the Staten Island District Attorney’s office. The assistant DA asked for Craig Raucher and not knowing what to think I of course answered the call. The ADA wanted to play ball with us and was told in his office that the Staten Island Basketball League had the best “run“ on the Island. Of course we invited him down. Now for those of you who play b-ball the term “run” has a much different meaning to players. Having the “best run” takes on a greater meaning. The term run is the b-ball language for the game itself in a venue. 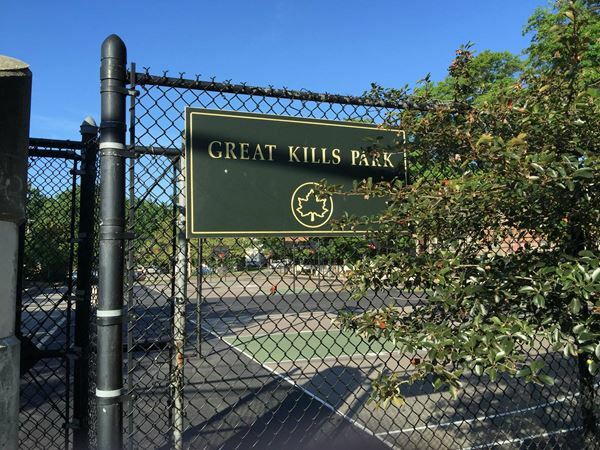 People come to different parks in New York City, different gyms and other locations looking for a good run. A good run means that the game is very competitive. It means that the players are very competitive. It means that the game is played at a high level with guys that can play. The magnetism and the appeal to players is that they always want to go to a place where the run is always good. Not good once in a while but good all the time. This league and these players here provide the run. We have the best run on the Island and prove it twice a week in and week out. How is your run? Here it is look at it. You have seen it years before in a thousand different cities. When you walk through the doors of the venerable school on to the time worn basketball court you are transported back decades. 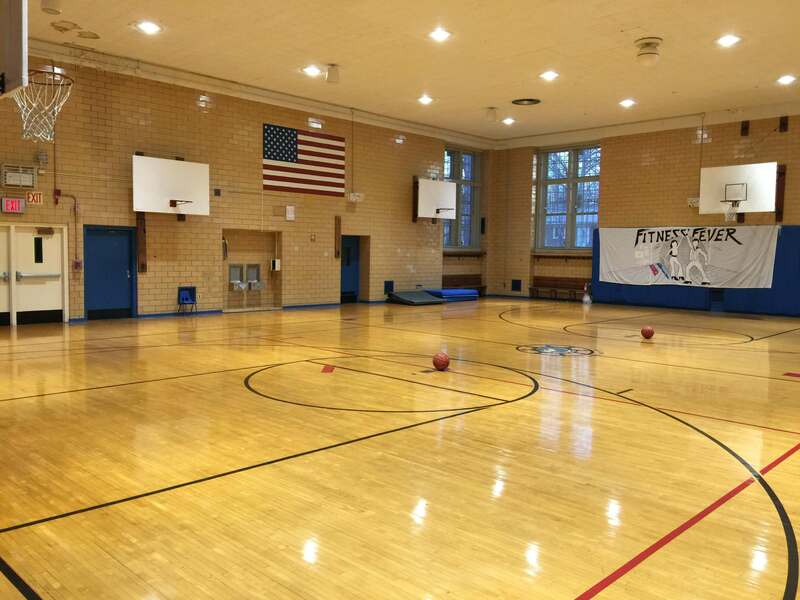 It is an old gym in an old school in an old working class neighborhood. The gym is defiant about giving in and at 80 years old looking forward to its 100 th birthday. The gym is well worn but well kept. The backboards are wooden and have accommodated endless bank shots and good shots and bad shots but remain strong and sturdy. The rims are forgiving and have accepted innumerable shots. The floors are aged but always washed and ready. Some spots are patched. The only modern features are the high tech speakers mounted on the ceiling connected to an equally high tech stereo system. We warm up to music from The Eagles to almost anything. The sounds are universal: squeaking sneakers, men yelling out picks, bodies hitting, cursing. Located right outside of Public School 8 where the League plays. We started as unlimited numbers of urban kids have always begun by playing in the park. Some call it the court or the yard or the school. Outdoors. New York, Chicago, Miami, Houston, LA, Madrid, Seoul, Cape Town all cities across the USA and the world have thousands of them. They are all the same: old, backboards metal and rusting, rims tight and unforgiving. Water fountains working or broken. Guys getting high in the back smoking weed, drinking, gambling. Maybe a net is electric taped to the hoop maybe it is just a rim. The court is cement hard. We went to learn how play the game school yard style. Play ground ball. No refs. Physical, difficult, uplifting and redeeming. The competition strong and the games intense. Nothing easy and you have to bring it. You lose and you can sit for an hour with many people waiting. You win and run the table you own the court. But only for that day. The game is pure. You score more points and you win. In the winter we shoveled the snow from the court and played with gloves on. In the Summer the sun was unrelenting and played until we wilted from the heat. From this park we played in places called the Pit, the Zoo, the Jungle, the Beach. Competition got bigger better and stronger. The lessons learned on the court carried through life. Team work, hard work, camaraderie. 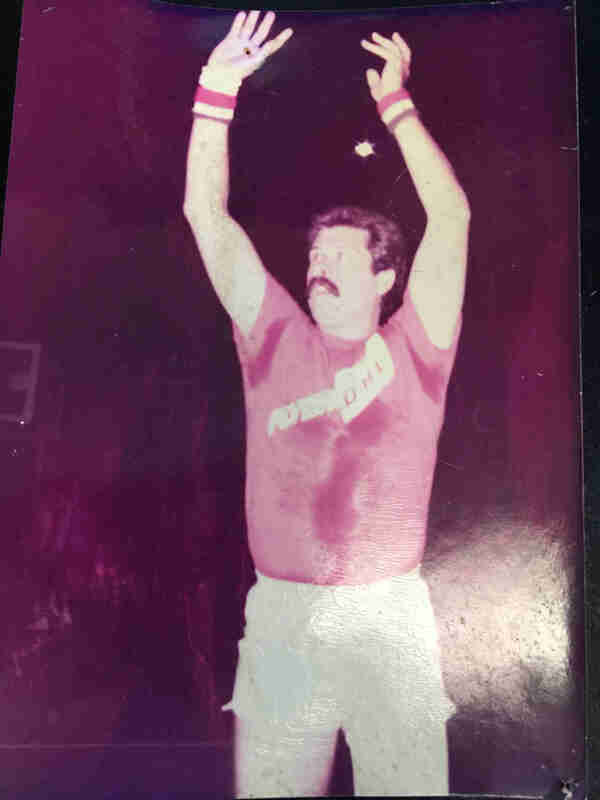 I am a 62-year-old man with a long and rich basketball history. I am the founder and Commissioner of the Staten Island Basketball League and have played organized and college basketball for 52 years. I’ve had many knee surgeries over the years due to basketball injuries. Eventually had to have both knees replaced as the pain was unbearable and the quality of my life was not good. 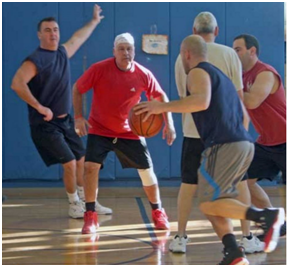 As an aging athlete, basketball and working out defined my nature and was a shield against growing old. I had first knee replaced at another hospital when I was 59 and the second knee replaced by Dr. Mayman when I was 61 at HSS. My experience at HSS from intake to surgery to post-op pain management to discharge was outstanding in every way. My only regret is that I only have 2 knees to replace (only kidding). I was told by both surgeons that I would not be able to play highly competitive full court basketball again. I listened but at that point was determined to get back to playing at a high level regardless of what I was told. I worked very hard prior to and after both knee replacements because I wanted to defy the odds. I worked with physical therapists several times per week supplementing those sessions with strong workouts in a fitness gym and using treadmill and stretching techniques in my house. Six months after the second knee surgery at the HSS, I began shooting. 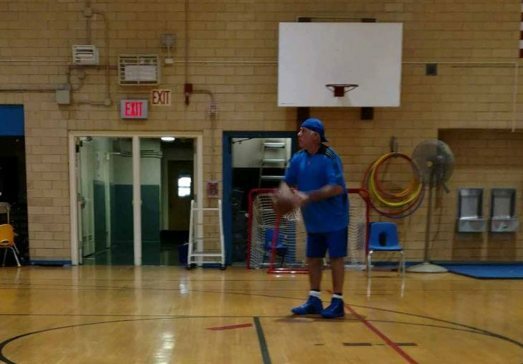 Around 9 months later I resumed playing full court basketball, twice a week, 3 hours each session, with men 30 years younger then me and holding my own. I am a living, breathing and playing testimonial to an individual who found the right surgeon in Dr. Mayman, found the right hospital in the HSS and added to this a very high level of determination to play ball competitively again. It has been three years since I had my last total knee replacement surgery. I was 62 at the time and now I am one month shy of becoming 65. My first total knee replacement surgery was at age 59. I was told that I would never play competitive full court basketball again. 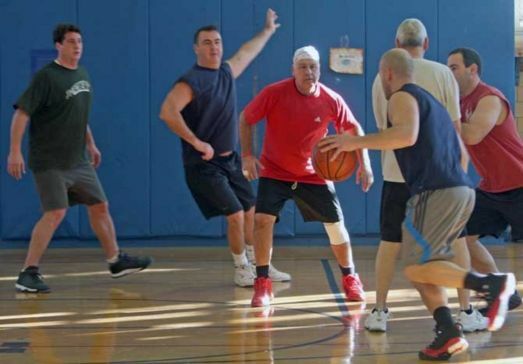 Since having my left knee completely replaced by Dr. Mayman 3 years ago at the highly respected Hospital for Special Surgery, I have played full court competitive basketball twice a week for three hours at a time with men in their 30’s. It tallies up to 1500 plus full court games, and 18,000 plus minutes and countless miles back and forth. I have absolutely no pain, no stiffness, good range of motion, can jump, can run, can cut, can box out and rebound with no problems. I even shoot with ease and scoring like a pro (in my dreams). Add to this the hundreds of hours on the treadmill and the time I spend on the leg weight machines putting pressure pin my knees … and I feel powerful. Several of my b-ball friends have approached HSS to seek consultations and operations for legs and hips as I have become a walking, talking, playing advertisement for this type of surgery. I always tell them the same thing: I was very fortunate to have found an excellent orthopedic surgeon in Dr. Mayman and that I was blessed to have found a great hospital. How many almost 65-year-old’s do you know that can play aggressively and at a high level not having had any surgery at all? Lastly my aggressive approach to rehabilitation and positive mental attitude combined with the surgical skills of Dr. Mayman and the help of the HSS all combined to help.